Three quarter length sleeves, pock pockets. Edge to edge jacket with hook and eye fastening centre front neck. Length from centre back to hem 20.5", 52 cms. Marks and Spencer size 16 jacket/blazer in "Blush." Marks and Spencer size 16 jacket in "Blush.". 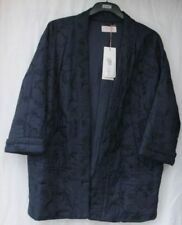 MARKS & SPENCER 3/4 LENGTH LADIES’ COAT (SIZE 16) NEW WITH TAGS. Press-stud fastening. Pockets. There are two marks on the collar: one from the coat hanger and a small ‘dot’ that has been on since it was bought. The length at the back from the bottom of the collar to the hem is approx 92cm/36.5”. The coat has been stored in a suit cover in a smoke free home. Will post Royal Mail 2nd Class Signature Required. 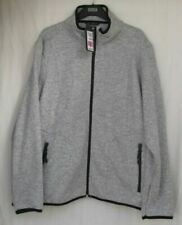 Marks And Spencer Ladies Zip Up Cream Jacket Size 16. Condition is Used. Dispatched with Royal Mail 2nd Class. Very good quality item. Drawstring hood. Drawstring to waist so can be worn loose or fitted and drawstring hem as well. If you buy more than one item I will invoice you with total amount due. Fits size 12 to 14. Ladies M&S Yellow Retro Print Soft Shell Bomber Jacket UK Size 12 Spring Summer. Condition is Used. Marks and Spencer Ladies Coatigan. Navy With Pockets. 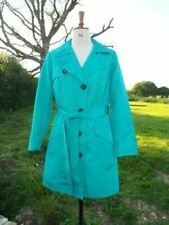 M&S Ladies Shower Resistant Trench Coat Size 8. Great used condition. Length is 98 cms. Sleeve length from under armpit is 51 cms. Fully lined. Marks & spencer ladies black trench mac coat size 10. Condition is Used. Dispatched with Royal Mail 2nd Class. Only worn once so in fantastic condition! Perfect for spring! From a smoke free and pet free house. Ladies coat black MARKS And SPENCERS size 14 good condition. Smart looking coat length is 40inches. Marks And Spencer Ladies Jacket Size 24. Lovely jacket worn only twice. In excellent condition. Floral summer jacket, size 12. Condition is New with tags from M&S. Dispatched Royal Mail 2nd Class. Thank you for looking, please check out my other items for sale! M&S collection. Casual jacket/cardigan, two front pockets and zip fastening. Round cut neck, subtle pattern, brand new with tags still on. Cotton and polyester materials. IT IS IN A FUSCHIA PINK COLOUR AND HAS A GOOD WEIGHT TO IT. THIS IS A LOVELY JACKET FROM MARKS AND SPENCER. IT HAS A CLASSIC COLLARED NECKLINE AND FASTENS WITH BLACK BUTTONS DOWN THE FRONT AND HAVE A GREAT PINK THREAD IN THEM. 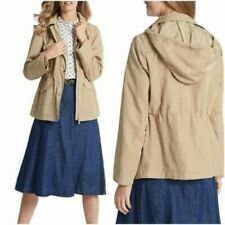 ''M & S COLLECTION'' LADIES NAVY BLUE MAC Size 20 perfect with spare button. Two front side pockets. Perfectly clean so ready to wear. M&S Collection Navy Blue Single Button Jacket Size 12 Lined Twin Pockets. Condition is Used. Dispatched with Royal Mail 2nd Class. Condition is V ery GoodUsed. Z ip a nd p op pe r fa st en in g an d Detachableh oo d. Length 28”. Un de ra rm to underarm 22”. Ladies Lightweight Quilted Jacket Red UK size 12. M&S Classic Range. Slightly shaped fit, 4 button fastening, 2 pockets with button detail. (see photos).